There is a traffic junction that I cross everyday to and from work. Underneath that junction is a subway station. In other words, there are two ways to cross the street to get to the other side. One is the walk on the road above while the other is obviously to go underground and use the station as an underpass. I have always been one to use the road as it is quicker and more direct. Granted that Taobaoland is notoriously known for their hay-wiring traffic where everybody ignores traffic lights, it is not necessarily a bad nor dangerous thing. In fact, in the capital, ignoring traffic lights is actually safe to the pedestrian. The Power Of Critical Mass. When EVERYBODY anyhowly cross the street, all cars, bikes, buses must stop. So one rainy day, to save myself from acid rain getting wet, I took the underground route and noticed the newsstand for the first time. It was a first time despite using the subway pretty often. 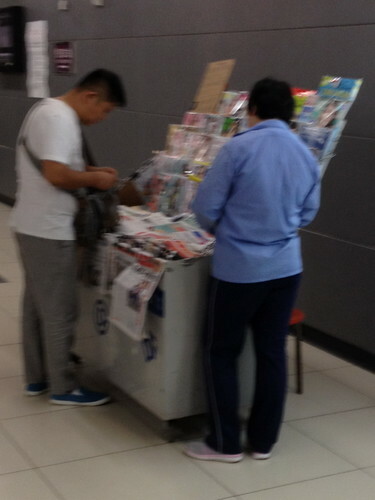 A closer look and realised that they have English newspaper. Ch1na Daily. Granted the news probably kelong one, I still bought a copy coz it was only RMB 1.50 (SGD 0.30). Besides, our own $traits Times lagi kelong one lor. Speaking of newspapers, I like South China Morning Post. It is Hong Kong's major English broadsheet. I like their objective reporting although it has been said that the Capital does have some influence over it when it comes to news critical to the main1and. Anyway, coming back, I regretted buying that copy of the local newspaper. It was a very thin newspaper without any interesting news. Perhaps it was a slow news day that day. I wonder if their weekend edition is better? Let's wait for the weekend then.